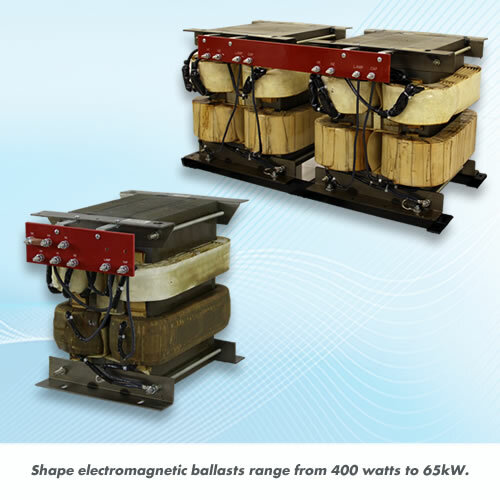 Ultraviolet light ballast transformers from Shape use medium-pressure mercury vapor and additive UV lamps to treat municipal and shipboard water, and to cure UV inks. Our electromagnetic ballasts (Mercury Vapor Ballasts) range from 400 watts to 65kW and have been designed to prolong lamp life and maximize UV ballast operating efficiency. Electromagnetic ballasts are primarily used to cure UV ink to paper. They are less expensive, and more reliable, than electronic ballasts. Electromagnetic ballasts typically offer only two or three output options. If additional control is required, Shape offers electronically controlled ferroresonant ballasts that have infinitely variable output and are more suited for applications that require greater control, like curing UV ink to plastic, where the printing surface is more susceptible to heat damage.